Most children need more than lectures and tests to learn. Some need a creative outlet; others need to see themselves in their educators or curriculum. Many need help processing trauma, while many others just need a push to believe in themselves. 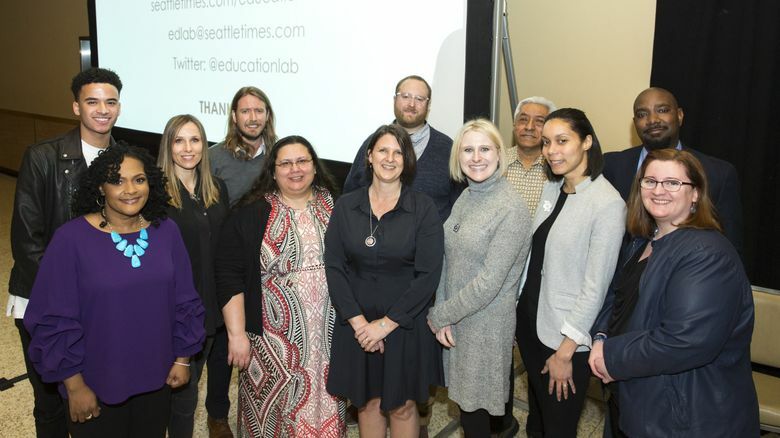 We learned all this and more from 11 insightful speakers at this year’s Ignite Education Lab storytelling event, which happened March 11 at Seattle University. The speakers were chosen from about 50 people who submitted their personal experiences for consideration. You can learn more about them here. The format of each talk was the same: five minutes with 20 slides each timed to advance every 15 seconds. If you weren’t in attendance, you can relive the evening’s stories below; note that the presenters’ slides are not visible in the videos. Imani Razat is a Seattle-based (by way of New York) home schooling mom who strongly believes that children should have some input on their education and preferred learning style. Dr. Shannon Hitch was born and raised in Seattle and has worked in special education for over 20 years. She is currently the director of Special Services in the Lake Washington School District. Gillian currently lives in Bellevue, where she grew up. She is currently making a career change and is completing a master’s degree in teaching at Seattle University. Ryan Healy is from Olympia and has taught for 13 years at Ridgeline Middle School in Yelm, Wash. There, he helped develop a transformative student-leadership program focused on social and emotional learning skills and character development. Noah attends Seattle’s first charter high school, Summit Sierra, located in the Chinatown International District. The majority of his extracurricular activities concern apparel and environmentalism. He is currently a fashion ambassador at Nordstrom. Victoria Mott has teaching experience spanning four continents and five countries. Today, she teaches science at Echo Glen, Washington state’s only coed juvenile-detention facility. Kari is a native of the Pacific Northwest, the mother of two teenage daughters and a huge fan of teenagers in general. She founded The SELF Project to promote mindfulness and self-awareness in teens, and to strengthen parent-teen relationships. Dr. Kimberly Harden is a professor at Seattle University. Her research focuses on gendered racism and its effects on African-American male students and faculty, and on how service learning enhances academic learning and civic engagement. Raúl Sánchez is currently working on the Spanish version of his inaugural collection, “All Our Brown-Skinned Angels,” nominated for the 2013 Washington State Book Award in Poetry. He is a poetry mentor in the King Co. Juvenile Detention Center. Tracy Castro-Gill is a founding member of the Seattle Education Association’s Center for Racial Equity. She currently serves as the Seattle Public Schools’ Ethnic Studies Program manager and is the 2019 Puget Sound ESD Teacher of the Year. Ricky Robertson is an educator, author and consultant who supports schools in developing trauma-informed systems that foster educator and student mental health and resilience.